This recipe came from a cookbook “Reflections of Our Lives” by the Gilroy Assistance League. Marty found this recipe in the San Jose Mercury News. It came from a cookbook “Reflections of Our Lives” by the Gilroy Assistance League, from Rose Emma Pelliccione. Trusting Marty’s taste in food, I believe that this recipe will be one you will use over and over again. Thanks Marty! Cut baguettes in half lengthwise. Scoop out soft bread with your hands, being careful not to break through the crust. Saute scooped-out pieces of bread in butter with garlic. 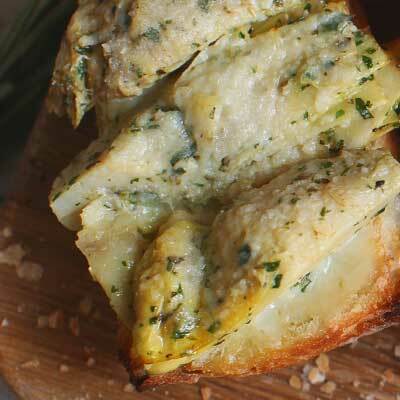 Combine sour cream, Monterey Jack and Parmesan cheeses, artichoke hearts and sauteed bread. Fill bread shell with mixture top with Cheddar. Bake at 350°F for 15 to 20 minutes, until bubbly. Cut into 2 inch pieces and serve hot. Marty has shared an office with the Santa Cruz County Farm Bureau for over 35 years and has been a friend and supporter of the Farm Bureau and its programs. Trusting Marty’s taste in food, we believe that his recipes will be ones you will use over and over again.